For Christmas this year, my wife gave me (among other things) Another Tough Puzzle. This puzzle claims that "with millions of wrong solutions, the chance of solving this puzzle is ONE in 600,000!" 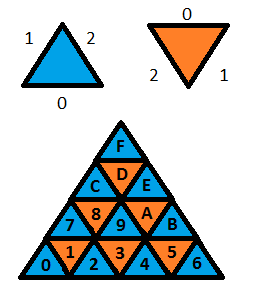 There are 16 triangular pieces and each piece has three connections each being one of four possible shapes. The completed puzzle should be a pyramid with six connections on the edges pointing in and six pointed out. The puzzle also claims that "it looks easy...but just when you think you've solved it, the last piece proves you wrong." This is very true and very frustrating. I (and others) played around with the puzzle for a while always ending up with one piece that didn't fit. Then I thought, "I write software for a living; why don't I do that here?" I've enjoyed writing solvers in the past (my Minesweeper solver would actually play the GUI for you on previous Windows versions). I mostly use C++, so I decided to use it here as well. Certainly there are languages more suited to rapid development, but I'm a glutton for punishment. The first step was to describe the pieces. We noticed pretty quickly that half of the pieces have two outward-facing connectors (outputs) and one inward-facing connector (input) and the other half are opposite (two inputs and one output). There are no pieces with three inputs or outputs. Now that the pieces are all set up, the gameboard must be described. The end result should be a pyramid made up of all 16 pieces (see diagram). Therefore, I had to describe how the pieces relate to each other in the gameboard. This will allow the solver algorithm to test that a piece 'fits' if its connectors match the adjacent pieces. In order to do this, each position in the desired puzzle shape is marked with a number and each side of the triangular pieces are numbered as well. The sides are always numbered clockwise starting at the horizontal side so that adjacent pieces in the puzzle have sides matching (for instance, pieces 7 and 8 both share their side number 2). The fitting function is recursive. The first time it is called it has all 16 pieces remaining to try and fit. It loops through all remaining pieces rotating them in all possible positions each time checking to see if the piece fits. If the piece fits, it calls itself again this time with 15 pieces remaining. When a pieces is found that fits, it calls itself again with 14 pieces remaining. And so on, and so forth until all pieces have been used. If a piece doesn't fit, it goes on to the next piece. If a solution is found or no more pieces fit, the function returns and tries the next piece. Since we only have 16 pieces, I use a bitmask to determine which pieces are already used. That's all there is to it! I probably spent less time writing this program than manually (and frustratingly) trying to find the solution. If you'd like the full C++ source: Go here. Ah, brute force... the bluntest of the instruments in the programmer's toolbox. I would mock you for writing code on vacation, if I hadn't done exactly the same thing. It almost looks like you could tile multiples of this puzzle together, with the solution pictured. Have you thought about updating the code to check if that's feasible? I haven't specifically approached that problem, but I did later extend it to output searchable patterns for the edges (i.e. so you could find solutions where all edges are alternating in/out, etc.) Based on that, I'm sure that it's possible to attach multiple puzzles together in larger configurations. Hi - I came upon your post because I wrote a similar program to solve the same puzzle. I basically took the same approach as you. My version also solves for a variable number of "game sets", allowing 4 (or more) sets to be combined to create larger and larger pyramids. One minor thing I wanted to mention. I think there are actually only 172823 unique solutions. I exclude 2/3 of 518469 because they are basically just the entire solved puzzle rotated. 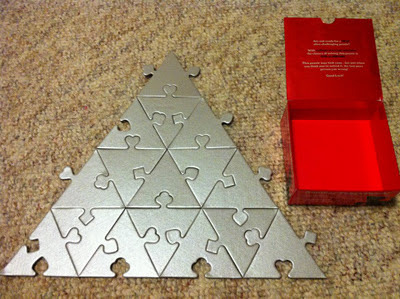 I just received this for Christmas and have just opened the box and put it together into a triangle that meets the requirement of six outward facing and six inward facing joints in a triangle formation, and got it first go. The box claims there are 600,000 wrong ways to assemble the game but only one solution. Unless the pieces in each box are different (mine have both sides black) my solution differs from yours in the placement of the inward and outward facing joins. great and nice blog post.thanks for sharing. I played around with the puzzle for a while always ending up with one piece that didn't fit.